Next year the 2020 Census will be upon us. Over time this site will be updated to reflect new information, but the fundamental issues have not changed and are as relevant as ever. As of this writing the 2010 Census is over, at least as far as the mailing in of census forms is concerned. Of course the Census Bureau will continue its "mopping up" operations for some time; attempting to extract more information from Americans who have provided only the head count which is required to fulfill the census' constitutional mandate. Although the deadline for mailing in census forms has long passed this site will remain online as a reference. To our knowledge, nobody was prosecuted or fined who stood their ground and refused to comply with requests for information over and above the constitutional requirment for an enumeration. Thank you to all who have taken a stand for limited, constitutional government. 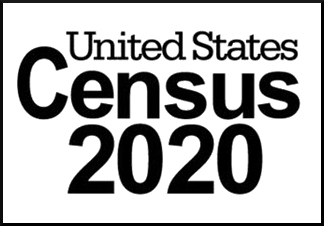 Note: By April of 2020 the federal government will have loosed upon the American people a flood of census forms and an army of census takers. The Census Bureau has embarked on an unprecedented propaganda campaign urging Americans to give up their personal information for the alleged “benefit” of their communities. The Census Bureau claims that we are all “required” to answer all questions put to us. (They wouldn’t lie to us now, would they?) But what exactly is the authority for the census, and just what is a “census” anyway? Our federal Constitution authorizes the census for only two purposes: Article I, § 2, clause 3 and Amendment 14, § 2 provide that representatives shall be apportioned among the states according to their respective numbers. Article I, § 9, clause 4 provides that direct taxes are only to be laid in proportion to the census or enumeration. This is an exhaustive listing of all the Constitutional provisions that authorize the federal government to conduct the decentennial census. Click here for a prepared statement in that you can print and return with your census form. Click here for a Public Servant Questionnaire which can be presented to Census takers who may arrive at your door seeking information. § 5: The Secretary shall prepare questionnaires, and shall determine the inquiries, and the number, form, and subdivisions thereof, for the statistics, surveys, and censuses provided for in this title. § 141(a): The Secretary shall, in the year 1980 and every 10 years thereafter, take a decentennial census of population known as the “decennial census date,” in such form and content as he may determine, including the use of sampling procedures and special surveys. In connection with any such census, the Secretary is authorized to obtain such other census information as necessary. The Secretary shall “determine the inquiries ... for the statistics, surveys...” and obtain “other census information as necessary.” Because the rule governing statutory construction requires that we do not construe a statute so strictly as to render it unconstitutional, this “other census information”is limited to how many people live in one’s home. 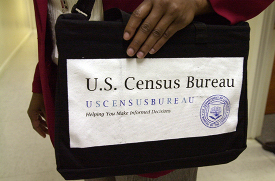 Notwithstanding the foregoing, the Census Bureau gathers a “wide variety of information on social and economic characteristics of the population, such as household composition, ethnicity, and income...” But gathering this information is beyond the legitimate scope of governmental authority, as it has been conferred by the Constitution. § 221. (a) Whoever, being over eighteen years of age, refuses or willfully neglects ... to answer, or to the best of his knowledge, any of the questions on any schedule submitted to him in connection with any census or survey provided for by subchapters I, II, IV, and V of chapter 5 of this title, applying to himself or to the family to which he belongs or is related ... shall be fined not more than $5000. The fine, previously set at $100 for the 2000 Census, was raised significantly for 2010 in an apparent attempt to frighten and coerce the public into compliance. This important Amendment should be read, understood, and memorized by all Americans. It was intended to confirm the understanding of the people at the time the Constitution was adopted, that powers not granted to the United States were reserved to the States or the people. (United States v. Sprague, U.S.N.J.1931282 U.S. 716; as well as U.S. v. Thibault, C.C.A.N.Y.1931, 47 F.2d 169). Having established that federal government may not legitimately expand their census inquries beyond enumerating the people in the districts, we shall now see how our courts have treated the issue. Note that the courts have never squarely addressed the matter of constitutional authority, at least not in any published case law that we have been able to find. The courts have addressed many collateral issues, nonetheless. For instance, in Republic of Hawaii v. John D. Paris, a state appellate court determined that a census law did not authorize the Board to make a cenus of the wealth of the inhabitants. This was an 1897 decision. Provision of this section making it offense for person over 18 to refuse or willfully neglect to answer any question on any schedule submitted to him in connection with any census was not rendered unconstitutionally vague and indefinite because of the need to refer to other sections in order to determine census required. Besides addressing the matter of the void for vagueness doctrine, the Little court also addressed the issue of 4th Amendment violations: The fact that many personal questions might be asked in order to provide statistical reports on housing, labor, health, and welfare matters did not make census questions unconstitutional on the basis of invasion of person’s right to privacy. This is probably true – but it is completely irrelevant. The fundamental issue is not one of privacy, important as that may be, but that of Constitutional authority for the information to be gathered in the first place. Now the question arises: “What will happen to me if a census taker knocks on my door, I ask him to show me his constitutional authority; and when he can’t, I tell him how many people live in my home and close the door?” In the old § 221, there was a provision for, in addition to the fine, up to 60 days imprisonment; but that has been repealed. If the Census Bureau were to try to actually fine you – and we know of no one this has actually happened to in several decades of census-taking – then you have the right to have the case heard in court. You can challenge the fine on the basis of the 10th Amendment and be on solid legal ground. Some people may wonder why they should risk a fine and resist answering the questions. First, we should resist the encroaching onslaught of socialism. Socialistic societies require their governments to keep detailed information on the populace; it is one of the earmarks of total government. In such a society, government micro-manages and macro-manages every facet of life and this cannot be done without voluminous amounts of private information. Socialist governments, in fulfilling their purpose of wealth redistribution (i.e., plunder), need to determine who to discriminate against and who to favor, hence the need for such information-gathering. Second, we have a responsibility for the legacy of freedom that we leave our descendants; we are the custodians of their liberty. Of course, Americans tend to be highly independent thinkers, not lemmings. Many of us take offense at government efforts to socialize and globalize America, and we are willing to peacefully resist the encroachment of our liberties. Accordingly, we demand that our government act in accordance with the very Constitution that created it. If government does not act in compliance with the Constitution, then we have by definition fallen into a state of anarchy and tyranny. The Constitution does not authorize such usurpation. So, what are you going to do when you receive your form and/or the census taker knocks on your door? Your only lawful obligation is to be counted! Gender was probably a legitimate inquiry by the census takers before womens’ suffrage took effect. Disclaimer: The statements on this web site are not to be construed as legal advice, they are merely factual statements about the law. Legal advice can only be given by a licensed attorney.